Erikur's House is a large mansion lying just northwest of the Blue Palace. It is the last building on the right before the Blue Palace and across from the Bard's College and Bryling's house. There are two entrances to Erikur's House, with a third door leading out onto a small balcony that can be used as an exit. On the ledge southwest of the balcony, there is a Potion of Plentiful Healing. 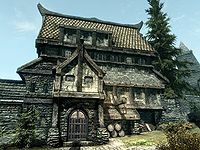 There are five barrels lying down to the right of the main entrance to this house and once you have completed the Thieves Guild special "reputation" job in Solitude there will be a sixth barrel stood upright to the right of these with the thief cache shadowmark Cache carved into the side of it. There is also a Shadowmark Protected to the left of both entrances and painted on a barrel by the second entrance. Upon entering through the main door you are on the ground floor, there is a wooden bench to the left of you and a smaller wardrobe on your right holding a jug and two goblets. Moving forward, on your left is a storage area and a second entrance. Against the northeast wall are a set of shelves holding several mead barrels, two bottles of Nord mead and a bottle of wine. To the right of this is a cupboard holding a knapsack and an iron mace. Opposite these is a pen holding twenty-one Honningbrew mead barrels, with several sacks of foodstuffs around it. Against an interior wall to the northwest is another cupboard this one holding various cheese wheels and wedges, with an unlocked safe to the left that is easy to miss. Continuing along the main corridor there is another wooden bench on the left with a small set of shelves opposite holding a bunch of tundra cotton, a pair of boots and a set of fine clothes on top. At the end of the corridor is an urn with tundra cotton sticking out the top and stairs leading upstairs. On the second floor, there is a bedroom on your left, it is the living quarters of Melaran and contains an owned single bed in the southern corner, with an end table with a candlestick on next to it. Beside this is an open box containing a sheaf of wheat, a sprig of snowberries, a blue and a purple mountain flower and an orange dartwing. To the right of this, in the western corner is a wooden bench and small wardrobe holding a candlestick and a copy of Uncommon Taste. In the northern corner is a seating area consisting of a wooden bench and chair arranged around a low table holding a plate with bread and cheese, a goblet and a copy of The Cake and The Diamond, there is also a small table in the corner with a lit candle on. Above this are two wall shelves holding a bowl, two goblets and a cup. There are two decorative urns in the room with tundra cotton in them. Opposite the door to the bedroom in the corridor is a small wardrobe with an open box on top holding four soul gem fragments, a deathbell flower, a bulb of garlic and a potion of strength. Past this the corridor opens out into a room, on your right is the third entrance with a small wardrobe against the southwestern wall with two deathbell flowers on top and a basket containing two bunches of lavender beside it. Opposite it is an urn with tundra cotton on a small round table. 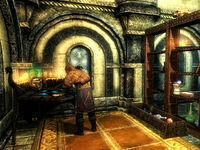 Coming out from the northeastern wall are bookshelves containing a potion of ultimate magicka, a potion of vigorous stamina, a weak poison, a weak stamina poison, an empty lesser soul gem and several common books. Next to this is a long open box containing a bunch of lavender, a bunch of juniper berries, a potion of plentiful magicka, a potion of minor healing and two empty lesser soul gems. There is also a petty soul gem on a stand. In the northern corner is an arcane enchanter. Against the bedroom wall, to the southwest is a wooden bench and an open box containing a potion of strength, two soul gem fragments, two blue and one red mountain flowers and a deathbell flower. To the northeast is a fireplace with a cooking pot in front of it on a stand, under the pot is a portion of raw beef and to the right is a cabbage in a cast iron pot. On the mantle above the fire is a bottle of frostbite vemon, two goblets and a bowl. On the left is a small round table holding a goblet and bottle of wine. To the right is an intimate eating area with a small square table and two chairs. On the table are two plates of [[Skyrim:|Seared Slaughterfish Steak|seared slaughterfish steaks]], two goblets and bread and cheese. Over this is a wall shelf holding a potion of regeneration, a bunch of tundra cotton and a large coin purse. Finally against the northeastern wall is a narrow table holding a goblet and plate with three salmon steaks. Climbing to the top floor you reach a balcony that goes all the way around the building, but still allows views down to the center of the house. Turning left at the top you pass a small table and wooden bench. In the western corner are two book shelves, a low table and chair. On the table is a goblet and a copy of Shezarr and the Divines. The bookshelves contain eleven common books, a solution of strength and a potion of extreme stamina. 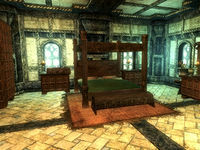 Continuing around the balcony you come to Erikur's bedroom which contains an owned four poster double bed. There is a long chest at the end of it, a small wardrobe to the left of it has an open box on it containing a bunch of tundra cotton and a red mountain flower. There is a tall wardrobe against the southwest wall and a set of shelves to the left, behind the open door. These hold two slaughterfish scales, a bowl of glow dust, a potion of haggling, two bottles of frostbite venom, a deathbell flower, a bowl of void salts and a basket containing two bunches of lavender. On the right side of the bed is another low wardrobe. Against the northeast wall is a low wardrobe with a goblet on top, to the right of this is a wash basin on a stand and a basket containing a small coin purse. Beside these is yet another wardrobe with two goblets and a jug on top. Against the southeast wall is a narrow table with a bowl of bread, a sliced eidar cheese on a plate and an iron dagger and above this is a wall shelf holding a bunch of lavender. Back out onto the balcony and continuing to travel clockwise you pass a narrow table with a platter holding two sweet rolls and two honey nut treats on and an urn with tundra cotton beside it. Above is a wall shelf holding a bunch of lavender and a potion of plentiful healing. In the north corner is a wooden bench. Along the northeastern wall is a cupboard and in the eastern corner another wooden bench beside two small tables holding a goblet and bottle of wine, a plate of bread, cheese and a tomato and copies of The Seed and The Windhelm Letters. Along the southeastern wall is a bench and then further along are two small cupboard with a drum, a flute, a potion of health, a goblet and a jug on top of them. There is a "Protected" shadowmark to the left of both doors and on a barrel by the side door. Despite this however, the house can still be the target of a Thieves Guild special jobs quest. This issue has been addressed by version 2.0.3 of the Unofficial Skyrim Patch; the house is no longer a valid quest target.